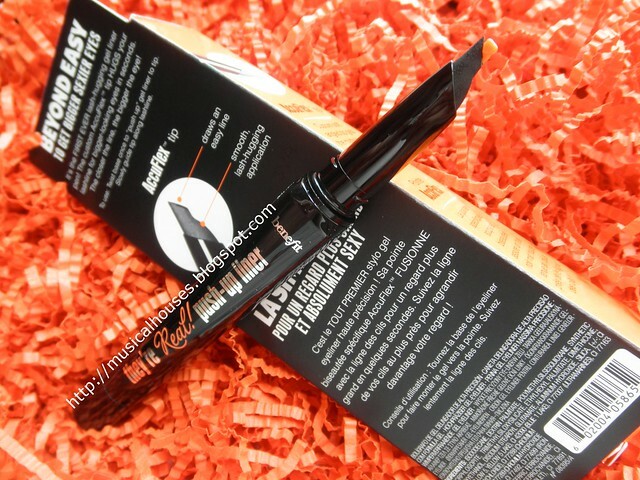 Benefit They're Real Push Up Liner Review and Swatches: Really Worth the Hype? Benefit's latest eyeliner, the They're Real! Push Up Liner, has finally launched, and you can bet the hype about this "lash-hugging gel liner pen" (Benefit's words) has been nothing short of craazy. The hype for the They're Real Eyeliner is probably one of the most I've seen for a recently launched Benefit product. Everyone is talking about it and raving about it, and I just had to check out the hype! 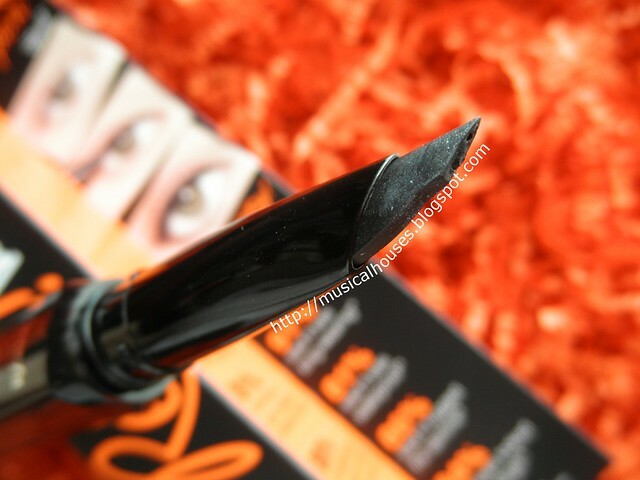 Benefit They're Real Push Up Liner: Definitely Benefit's most hyped product to date! I happened to be travelling to Turkey (you would have seen some of my travel photos on Instagram) while the hype was building up, and when I came back to Singapore, the next thing you know, everyone and their mothers were talking about it! And, the They're Real Eyeliner just launched yesterday, so I thought since I had the product on hand, I should do a review too, and see if it's really worth the hype. Benefit They're Real Push Up Liner: Claims to help you get gorgeously-lined eyes in a jiffy. The hype generated comes from lots of things - from the unique "Accuflex" tip that the pen nib has, to the claims that it is waterproof, smudgeproof, and long wearing. The unique shape of the They're Real! Eyeliner pen is supposed to allow us girls who have trouble lining their eyes to finally line our peepers like a pro. Well, a claim like this is best tested against the hardest-to-line type of eyes, and yours truly, with my small, flat, contour-less eyes, and what I like to call a hooded lashline (that Asian fold of skin that hangs over your lashes and makes your eyeliner "disappear" once you open your eyes - you girls will know what I mean! ), thought that there would be no better guinea pig than me. The crux of one of the claims of Benefit's They're Real Push Up Liner: the Accuflex tip. So I couldn't wait to try this out, and see if it indeed lived up to the hype of making my eyes prettier more easily and quickly! The little hole in the Accuflex tip of the Benefit They're Real Push Up Liner dispenses just the right amount of eyeliner. 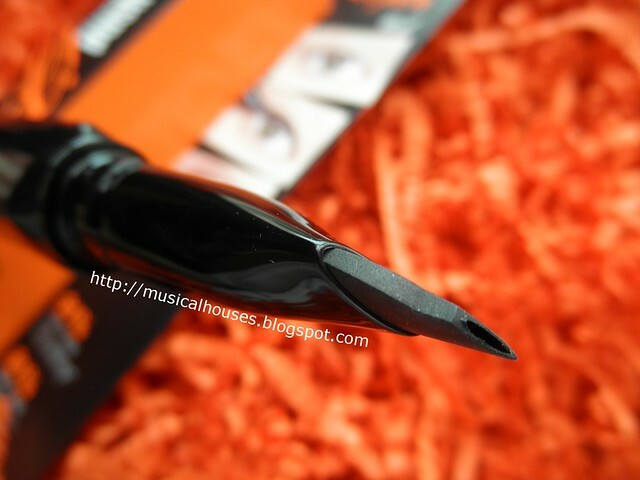 The Accuflex tip is actually pretty unique - as of now I don't have any other eyeliner in my stash that looks or has a tip like this. So in that sense, I can see why there is so much hype. Benefit's Accuflex tip is actually a wedged-shaped silicone tube that's sharp on one end, with a hole in the middle for the gel eyeliner to come out. 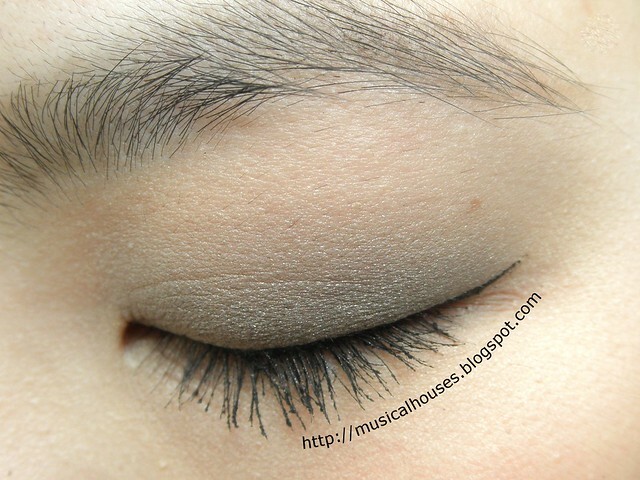 The eyeliner pushes out when you turn the base of the product (which turns with a satisfying "click" sound), and when you see a little product peeking out of the hole, you can start lining your eyes. I tend to just swipe the initial product that first comes out on my hand, as it comes out in a tiny glob, but after that the product is good to go. The only thing is - how many clicks do you first need to prime the product during initial use? It seems to vary a lot. The Benefit website says click the pen 8-10 times for the product to first flow out, some bloggers got it at 20-30 clicks, some got it at 50, and I got my first dollop of gel eyeliner dispersed only when I was well into the 60s. At that point, I was starting to worry that I had gotten a defective eyeliner! So if this happens to you, don't worry. Just keep clicking, and eventually the product will start seeping out (hopefully not wooshing all out at once though)! Benefit They're Real Push Up Liner: Took me over 60 clicks at first, but look, the gel eyeliner is finally coming out! When I first got it out, I decided to try a few swatches on my hand, for me to gain confidence, and for you guys to see the type of lines this pen can draw. The lines below you see are from the initial bit of ink the They're Real! 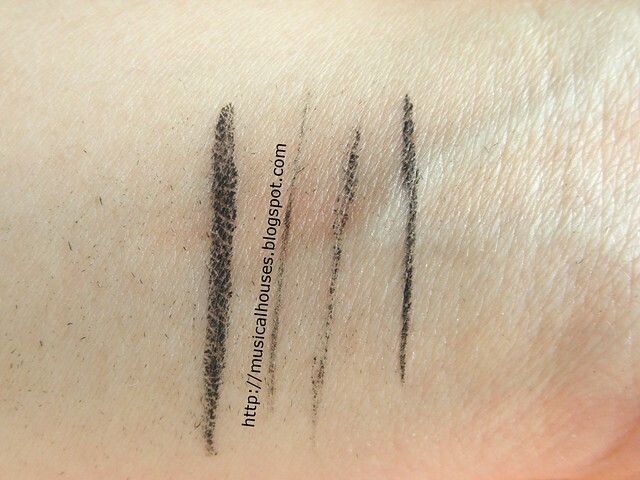 Push Up eyeliner pen dispersed - you can see that the ink is pretty nice and black and pigmented. I tried drawing my lines as thin as possible, just to see how thin I could get them. The answer? Pretty darn thin. I think this would be useful for all those delicate kitten flicks and super thin lines. 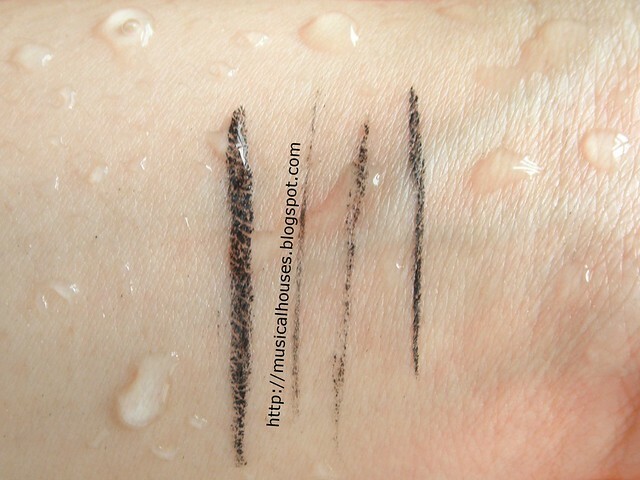 Then, because I could, and because it's par for the course for my eyeliner reviews, I subjected my swatches to the 1) smudgeproof test (aka me rubbing my swatches hard with my finger), 2) waterproof test (aka me dunking my swatches in water, under a running tap, and 3) the smudgeproof AND waterproof test (me rubbing my swatches hard under a running tap). Usually the last one is a killer - I think in all my 5 years of reviewing eyeliners (yes, that's how long I've been a beauty blogger and beauty junkie now! ), only one managed to stand up to that test. And how did the Benefit They're Real Push Up Liner fare? 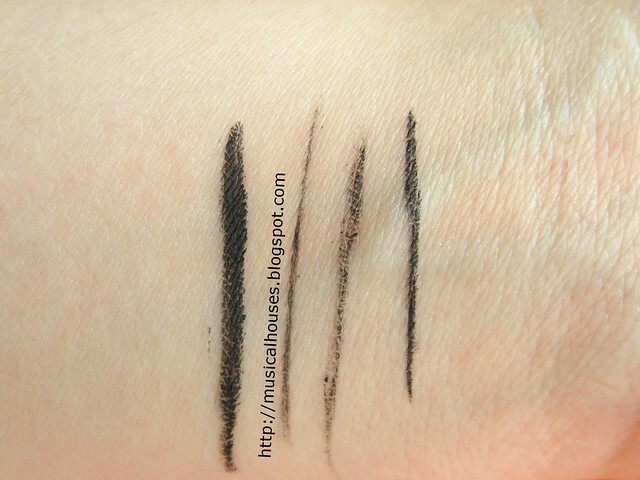 Benefit They're Real Push Up Liner Smudgeproof Test: Upon rubbing, smudges and flakes off slightly. First, the smudgeproof test above. When I tried to rub my finger over my swatches after the lines had dried, I realized that after awhile, they were starting to come off in little balls and flakes. Hmm. Not that good. But to be fair, the product was still not too bad, in terms of lasting power. The bulk of my swatches came out somewhat unscathed. Benefit They're Real Push Up Liner Waterproof Test: Yup, this is pretty darn waterproof! Next, the waterproof test. The They're Real! Eyeliner passed this test perfectly. Under a running tap, the swatches stayed exactly as they were. So if you're running about in the rain with this on, don't worry too much - chances are, your line is going to be just fine! Benefit They're Real Push Up Liner Smudgeproof and Waterproof Test: Unfortunately the combination of rubbing and water made the swatches fade. And lastly, the smudgeproof AND waterproof test. Now seeing how the smudgeproof test had come out, I knew this was probably not going to be one of those liners to make the cut. And as you can see from the photo above, the combination of smudging and a watery environment made my swatches basically almost disappear. I think this is probably because when I smudged the swatches, the product was started flaking off, and with running water to carry away the flaked debris and loosen more flaky bits, it wasn't too long before the lines just nearly disappeared. Benefit They're Real Push Up Liner: Look ma, winged eyes! I also decided to try the They're Real! Push Up Liner on my eyes, because I was determined to give this a thorough review. 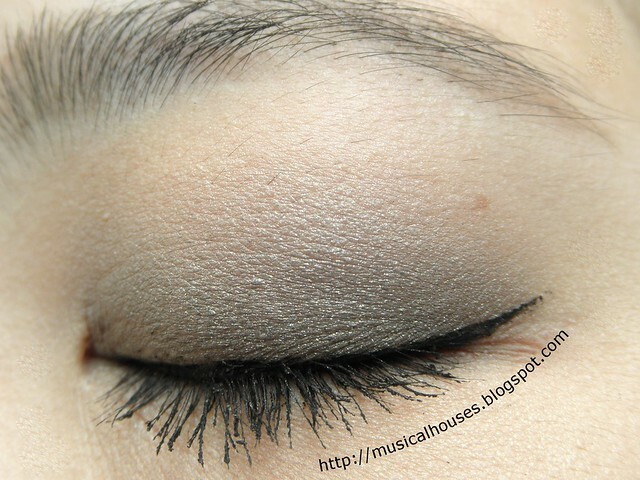 In the photos, I'm wearing another Benefit product, their Creaseless Cream Shadow in Skinny Jeans, blended out over my lid. I found that indeed, as you can see from the above photo, it did draw a nice, neat line. And there is no need to go over the same line again, because the first time round, the good pigmentation of the gel eyeliner pen means that you get a nice, inky, black line. 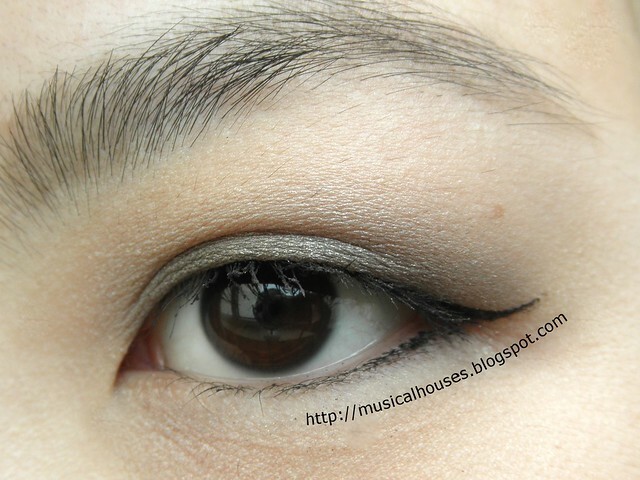 The sharp tip of the Accuflex nib also makes it easy to get that nice, neat winged flick that you see at the outer corner of my eye - I rarely ever do my eyeliner like that, because I have horrible eyelining skills, but this little flick was done on my first try. The line, as you can see from the photos of my eye, is also much thinner than the lines I normally draw - again, this is due to the nice thin hole in the silicone tip that dispenses just the right amount of gel in a fine line. Benefit They're Real Push Up Liner: Probably the best shot of my eyeliner - can you believe this was just one pass? So the pros are clear - you have a very nice, pigmented line that is very thin and fine, with the ease of doing a flick, because of the nib. But are they any cons? Sadly, as I wore the liner longer, and tried out various ways of lining my eye with it, yes. And this is where I think the product falls short of the hype a little. 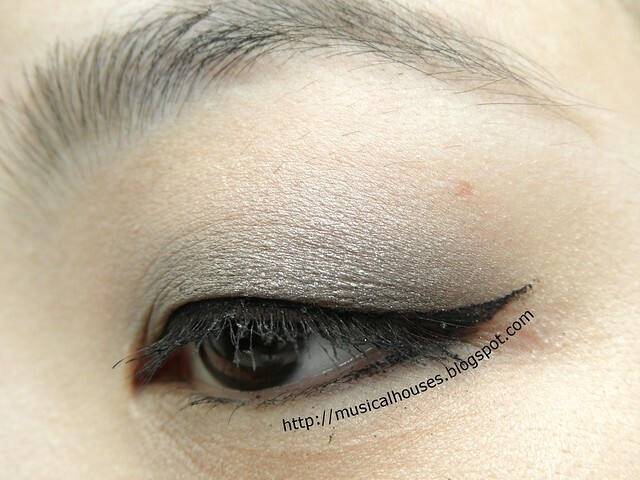 First, the gel eyeliner that Benefit used for this particular product dries really fast. Actually, it feels a little dry even coming out of the tube, and it dries quickly. Now normally drying quickly is a good eyeliner trait, and for sure an eyeliner that takes too long to dry tends to end up smudgy (especially with these hooded lashlines of mine). But the downside of such a quick drying liner is that when I tried to build up the product, say, when I was trying to go for a thicker line by applying a second layer after my initial thin line, I found that the product started to flake away. In fact, as I should have guessed from my smudgeproof test, this product is very prone to flaking. Even simple things like curling my eyelashes resulted in my carefully drawn line lifting up from my skin, flaking away, and sticking to the metal part of the eyelash curler! So I've learned that with this product, I should always, always apply mascara and curl first, and then line my eyes. A very fine line can be drawn with the Benefit They're Real! Push Up Liner, and the line is close to the lashline. The second drawback of this product is really also a drawback stemming from the flakiness of the eyeliner. It doesn't last as long as I would like to, because as the day progressed, it started to display slight flaking. I found that this flaking was very slight as long as I didn't touch or rub my eyes, but with my eye-rubbing habits, I realized that once I started rubbing my eyes, I was essentially rubbing my eyeliner off, and it was coming off in little black smudges and flakes. I suppose this won't be a problem as long as you don't rub your eyes, and in fact, if you don't, you could find that you can even dash about under the rain and your eyeliner will still be perfect. Unfortunately for me, I do tend to rub my eyes quite a bit, so the flaking was definitely a drawback for me. My eyes are closed normally here, but you can't really see the line because of my hooded lashline. As an interesting aside, let's delve a little into why this product is so effective at giving you a nice, smooth line that dries quickly on the skin. 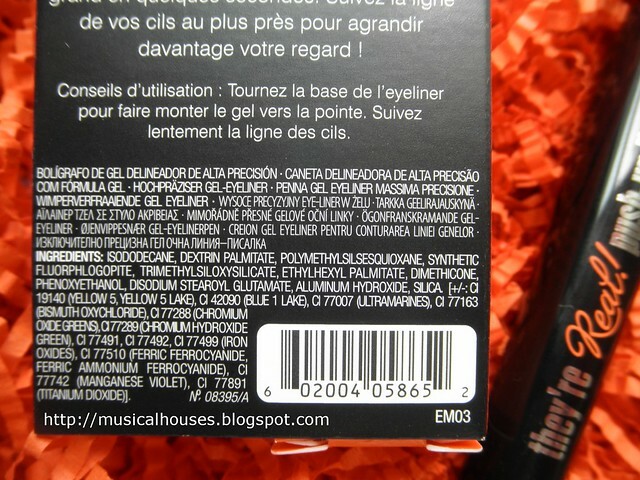 The first ingredient is Isododecane, and further down the list there is also Polymethylsilsesquioxane. BOth of these are silicones, but here they function as a volatile solvent (other examples being cyclomethicone, cyclopentasiloxane, and methyl trimethicone). This means that it is in liquid form inside the eyeliner pen, and when applied to your eye, the presence of these ingredients makes the gel eyeliner spreadable and fluid. But after you draw your line, these ingredients evaporates quickly, leaving behind the line that you draw, as well as a dry feel on your skin - in other words, the gel liner dries really quickly! Now as I've mentioned, this is fantastic in some ways - you dont sit around waiting for it to dry, and while it's drying, if you blink, it doesn't smudge. But on the other hand, it seems like in my experience, a line that is too dry ends up flaking. So now you know a bit of the science behind the product! Benefit They're Real Push Up Liner Ingredients: Volatile solvents evaporate quickly upon application to give a quick-drying liner. So, with all my extensive testing, with arm swatches, eye tests, and even a brief look at the ingredients - would I recommend the Benefit They're Real! Push Up Liner? Well to be honest, I have mixed feelings about this, despite the hype, and I can see why, although there are so many raves for this product, there are also those who dislike the product intensely. On one hand, there are clear things to recommend the Push Up Liner: it has a great shape, the Accuflex tip really works if you're drawing fine, thin lines with flicks at the end, and the gel eyelinr is a nice inky black, and dries quickly. But on the other hand, the formulation of the gel eyeliner is a little too dry for me, resulting in flaking, and subsequently, a shorter period of wear. It was also hard to draw thicker lines or build up the product on my eyelid. Perhaps those with oilier lids than I do might like this better (and I consider my lids to be pretty normal - I don't need eyeshadow primer as my eyeshadow usually stays, although I find having one helps). If you're looking for an eyeliner that will give you a great shape, and help you draw all those neat flicks and thin lines in double-quick time, and can withstand water, then the Benefit They're Real! Push Up Liner is one to watch out for! Just be careful not to rub your eyes too much while wearing it. The Bottom Line: Benefit's They're Real! 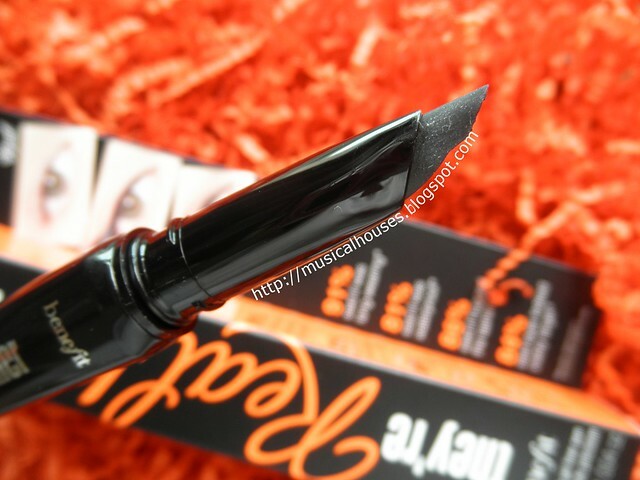 Push Up Liner has a unique tip that really helps to draw fine lines and flicks, but its slightly dry texture means that it is unfortunately prone to flaking off. This does have a lot of hype. I give that the silicone tip is unique but I do prefer a creamier liner. wow this is such an in-depth review! I really wanted to love this, but it fails on the longevity... smudges and flakes away. Not a pretty sight. I really wanted this to work for me but I'm very used to liquid liners so I find this a tad too dry for my taste and thy smudge too. Boo! I do love the tip, I find that it is very easy to get a good flick with this. Oh. I wish to try this too. This looks amazing and the black is so black. This is on my makeup radar although I got one marker like pen from Bourjois which is horrible. I love the wing you were able to achieve! Agree that the formula is a bit dry though. Awesome review! I loved your analysis of the ingredients, and that you were able to show us a very fine line on the eye. Most of the eye swatches I've seen of this so far have been extremely thick which gave me the impression that one couldn't get a thin line. That said, almost every review I've read, the tester has had similar results with the flaking. I think I'll stick with my tried and true MAC Pearlglide pencils. Again, fantastic review!